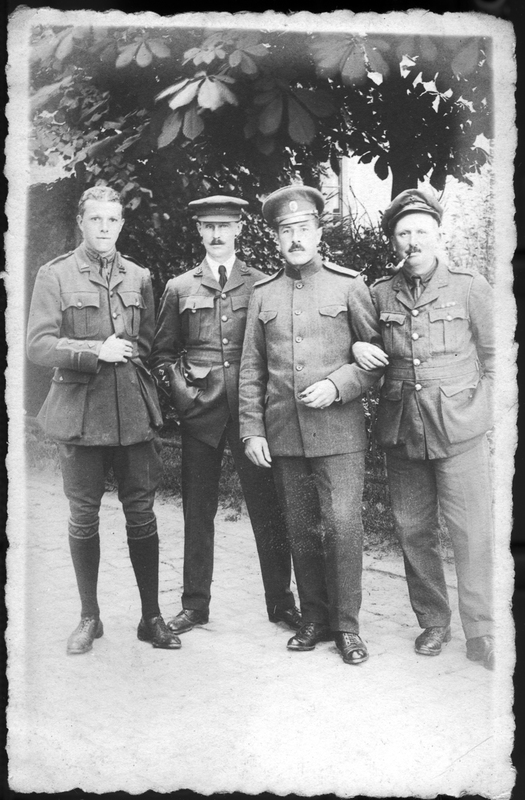 Part 4 of my grandfather Captain GHRB ‘Pat’ Somerville’s account of his experiences as a prisoner of war after he was captured at Zonnebeke near Ypres in November 1914. A professional soldier, he was born May 1,1893 in Wicklow, Ireland. He served in the 2nd Batt. 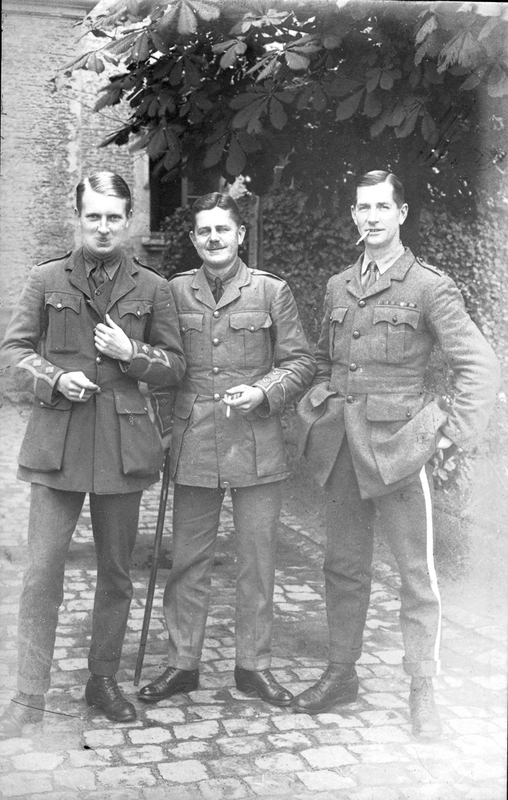 Royal Warwickshire Regt. Main gate Husarenkaserne 2014. White buiding (L) is Wellness Centre, cream building (R) is The Vera Beckers School. 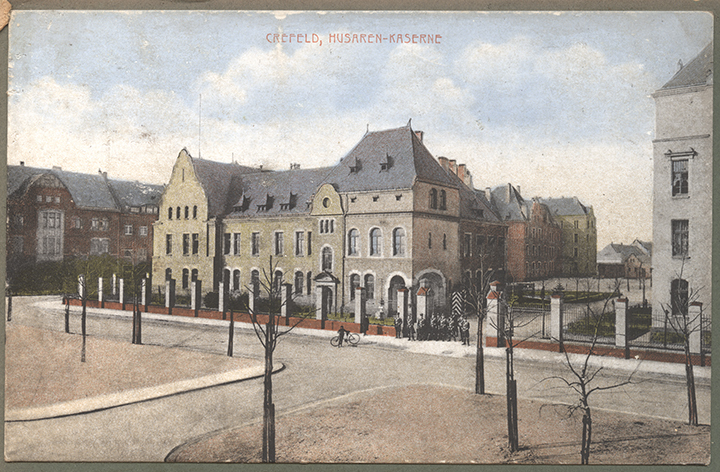 I visited Krefeld exactly one hundred years later in December 2014 to find the old cavalry barracks, the Husarenkaserne built in about 1910, still largely intact and recognisably the same place. 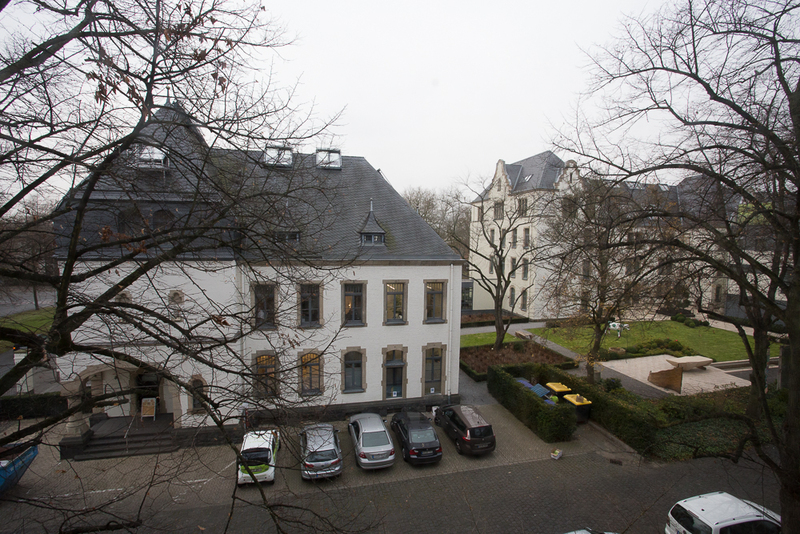 The main building along Westparkstrasse was converted into a smart Wellness Centre about ten years ago, previously it was still in the hands of the military and completely unaltered – now the interior is completely different; while the long barrack building is now a high school technical college. Other buildings, stables, etc on the west side have gone, possibly as a result of WW II bombing. The old cobbled parade ground has been partially built over by a second school building, the rest is largely grassed over and a bit of a wilderness. Inside Crefeld ‘kaserne’. Large building (R) is now a Wellness Centre. The low building (R) has gone replaced with a new 4 storey school building. 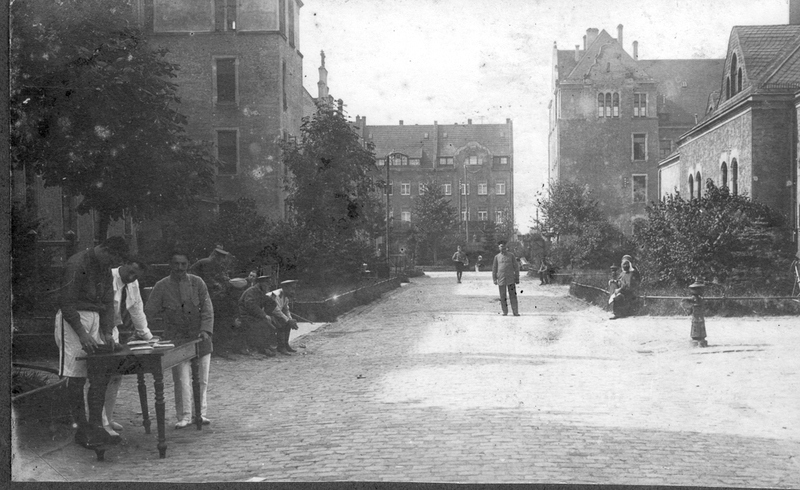 Long building in distance (still there) was German officers’ quarters on other side of Westparkstrasse. German in mid distance, the prisoners appear to be Russian, French and Algerian ‘Spahi’ seated right. Officer PoWs were all in the barrack building left. Orderlies were in stable buildings on the right. I was welcomed by the headmistress and her staff who showed me around the building and invited me to a Christmas lunch prepared by the cookery students. 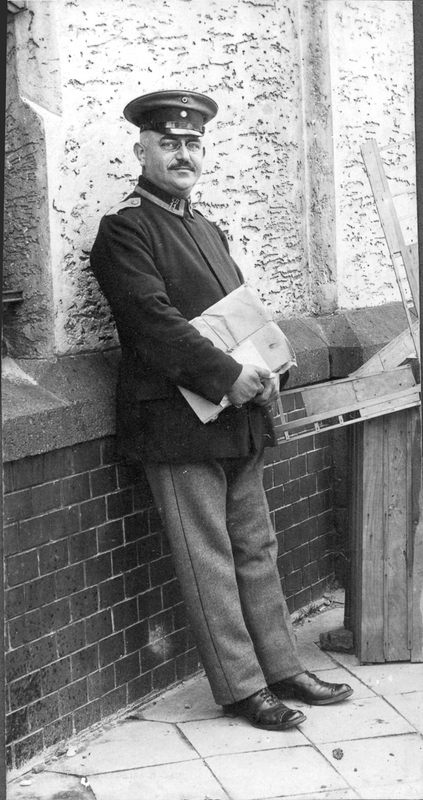 None of the staff had any idea that their school had been a PoW camp for 4 years in WW I and they were fascinated by the photos my grandfather and others had taken. 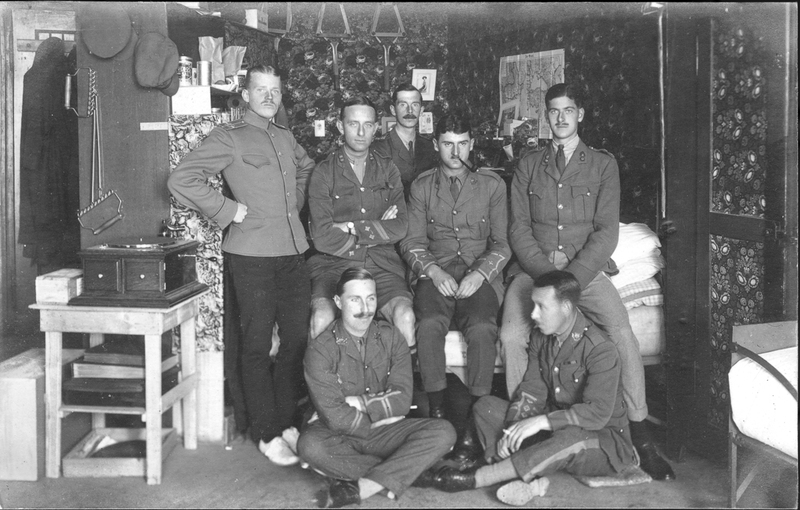 Somerville managed to smuggle his camera in his breeches on the long journey to Crefeld (as it was spelled until the 1930s) and found that photography as well as the keeping of pets, sport and amateur dramatics was encouraged by the commandant. Photos were processed locally by two labs, Samson and Co and Daniel Herm. 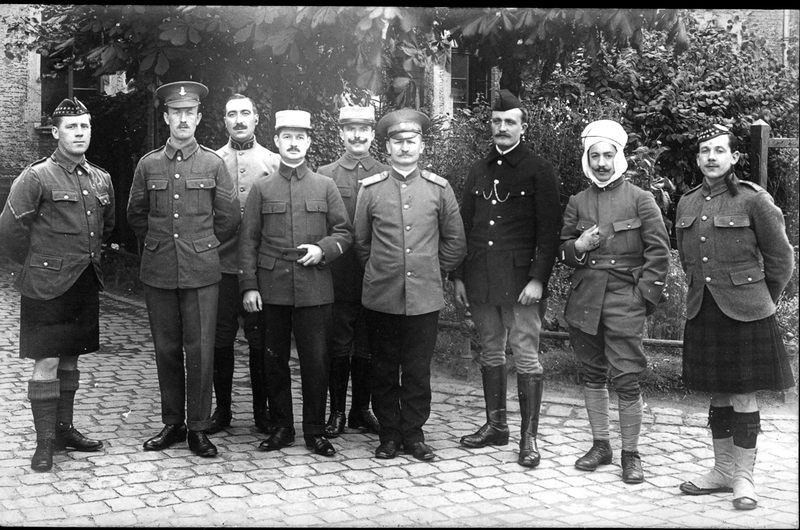 Sadly Somerville very rarely captioned his pictures, but I have been able to identify some of his fellow officers. My contributions are in italics. 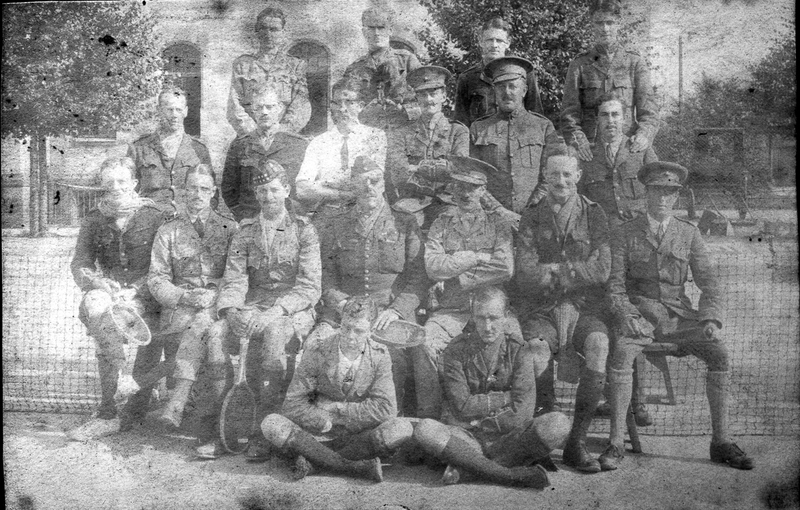 Everyone was thoroughly searched on arrival in camp but somehow the searchers overlooked a small folding camera I had slipped into the knee of my breeches with which I had taken some interesting snaps of the front and later in the camp. 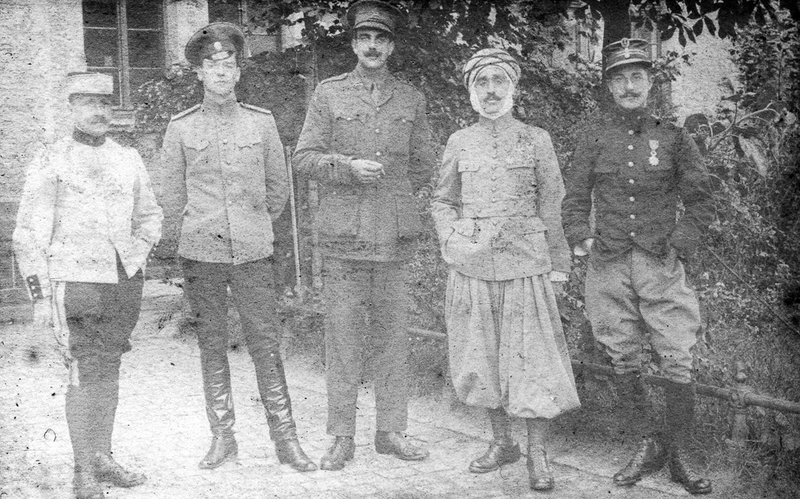 There were at this time some five or six hundred officer prisoners in the camp – British (incl. Empire and Dominions), French (and colonials), Russian and Belgian, and each day the numbers were swelled by fresh captures till eventually there was a total of about one thousand. 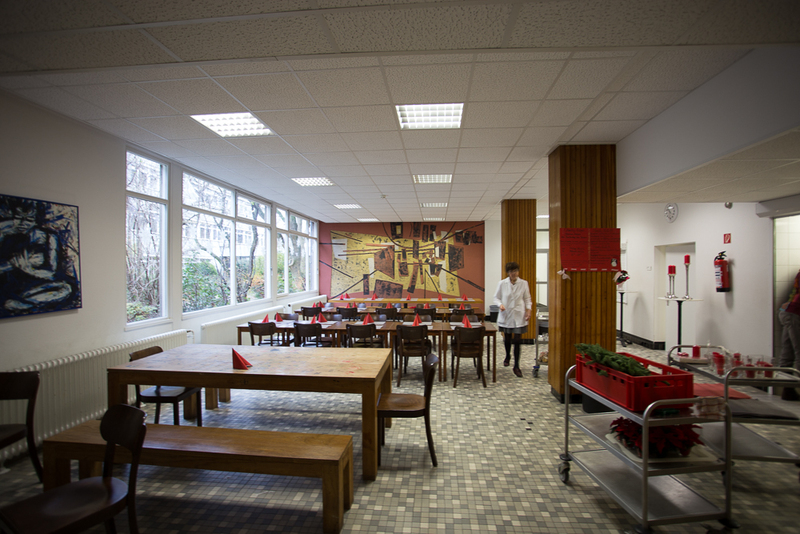 The various nationalities fed separately but were all mixed up in the various living rooms throughout the camp – a former German Cavalry Barracks especially converted. The idea of this mixing, apparently, was to prevent any well organised plan of escape or other “wickedness” being made – it being hoped that one nation would tell on the others. There were normally two roll-calls during the day – morning and evening – when all had to turn out and were formed out five or six deep. 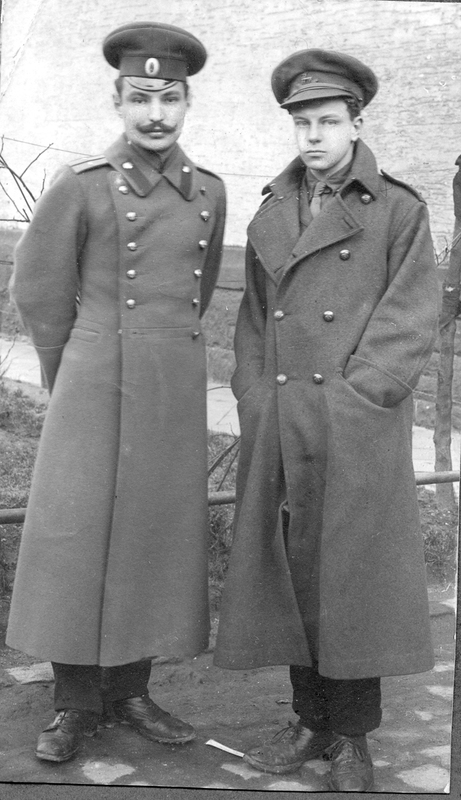 The counting would be a lengthy proceeding, especially when some of our gayer souls took it into their heads to “bait the Boche” and get themselves counted two or three times by such means as slipping along the back of the parade unnoticed after being counted and appearing again in the place of a blank file. 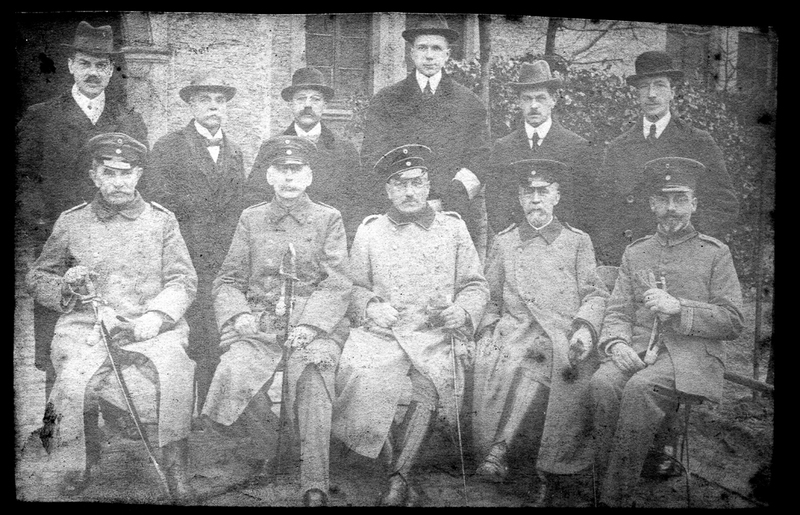 In many other ways also the Prussians’ power of self restraint was tried and tested and found wanting! 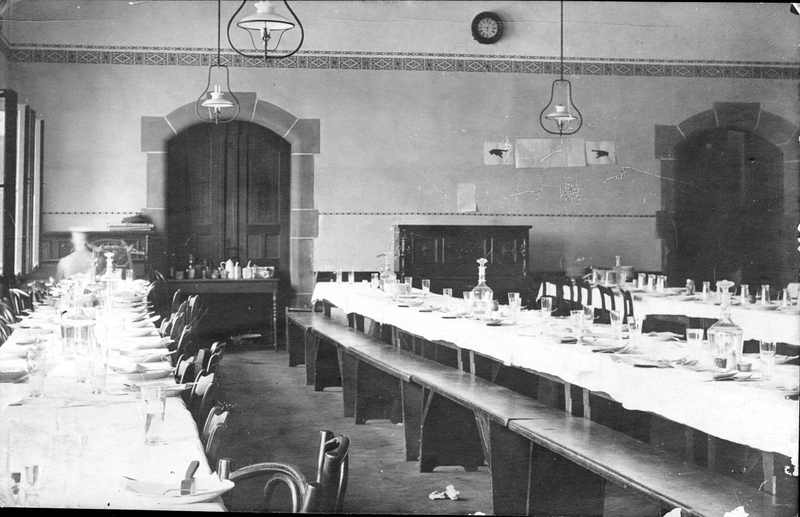 The meals at first were good – or so they appeared to us – though there were always rather an over abundance of the “national” food – the sausage in various forms. As time went on food got worse and worse till eventually one lived practically entirely on tinned and other foods from home. 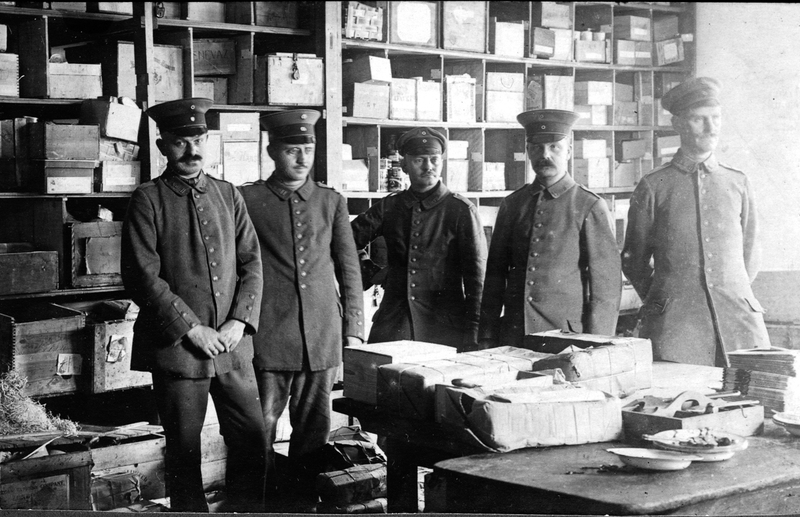 All parcels on arrival were opened by the Germans, the contents being locked up by them and issued each day at certain hours as required, after each article had been carefully inspected either by prodding or cutting it up. this was to prevent secret messages or implements of escape such as compasses or wire-cutters being received. From very early on attempts were made, and usually after each attempt a collective punishment was meted out to the rest of us. One of these punishments was to prohibit all smoking in the camp for a fortnight and to “ensure” this each person had to parcel up all his cigarettes and tobacco and hand it to the “Commandantur” or Orderly Room. At the end of the fortnight these parcels were brought out for re-issue but curiously enough a good many of them were not claimed. 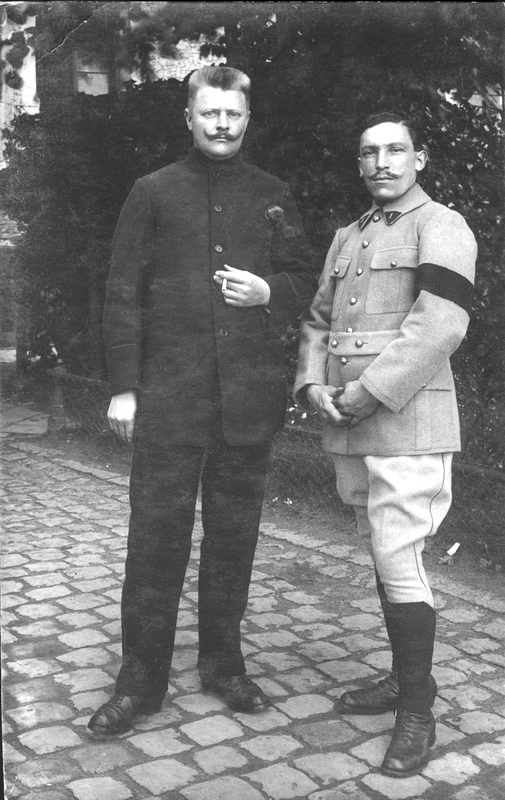 After a couple of days the Commandant announced that if these parcels of “smokes” were not claimed by that evening they would be confiscated and presented to the local Red Cross Hospital, they were not claimed and duly carted off. The Hospital benefited to the extent of many parcels containing nothing more valuable than grass, newspaper and lumps of coal!! 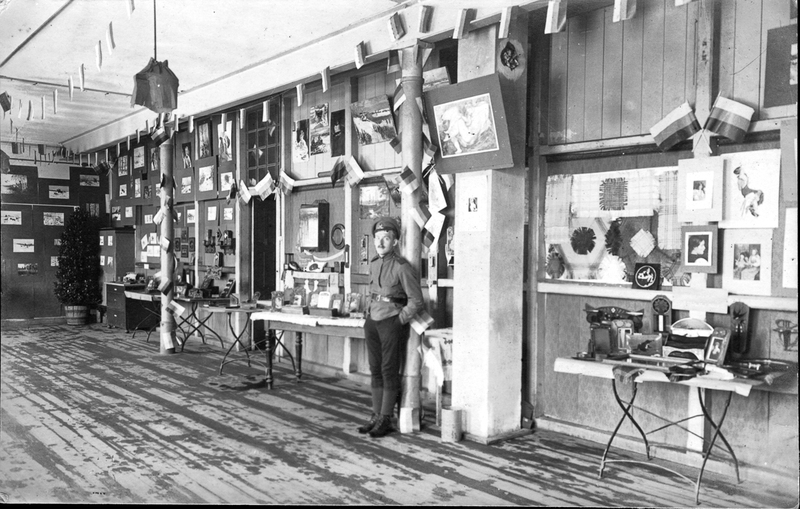 All kinds of games and amusements were organised in the camp but time weighed heavily as the months grew into years and the years passed by. Football and tennis were the great pastimes but the making of the tennis courts prevented difficulties as the only surface was that of the barrack square. However the results of combined effort on the part of those with little else to do was surprising. In May 1915 Italy joined the war, and the wrath of the Germans at this act was passed onto us in the prison camp. Things rapidly became worse, the hostile more hostile and overbearing, and this eventually forced our minds more and more to thoughts of escape. Attempts at escape became more frequent. Efforts to tunnel out of the camp were made on more than one occasion – but these never proved successful though some were discovered only just too soon and led to their makers having to undergo many weeks of cell. Two Russian officers managed to get out by hiding themselves in a refuse tub and being carted out of the camp on the daily “sanitary” cart. History does not relate when or how they left their “shells” once outside the camp or whether they crossed the frontier safely, but they never returned to our camp. A couple of us once had the idea of making a hanging trolley to run along some high tension wires stretched from the roof of a building in the camp to a house someway outside, the idea being to sit in this trolley and pull ourselves to freedom. Captive engineering experts however were doubtful as regards the strength of the wire and so the scheme came to nothing.